You can join organized bungee jumps at two sites in Washington state: the High Steel Bridge in Shelton and a private bridge in Amboy. 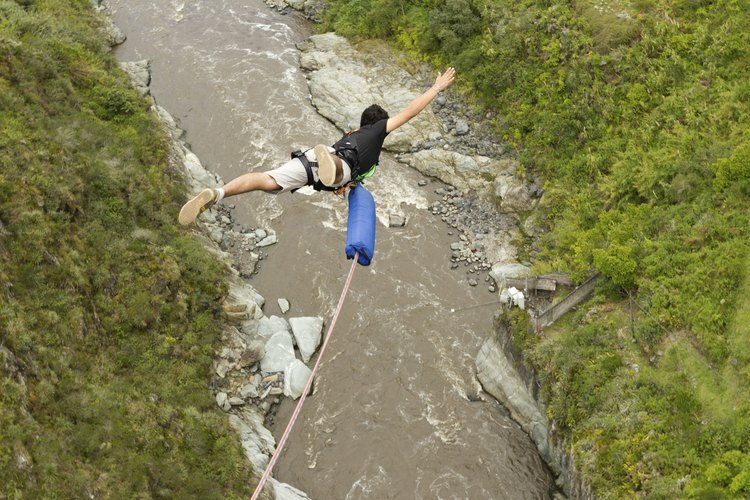 Organized jumps are the safe way to experience this extreme sport, as highlighted by a man’s near-death experience when his cord snapped during a 2009 jump from the Canyon Creek Bridge near Yacolt, Washington. Go with a reputable company, triple-check your buckles and you'll get a whole new perspective on the Pacific Northwest. Bungee Masters has access to a 200-foot high private bridge near Amboy, where you'll jump above a river, surrounded by a forest of pine trees. Located in southwestern Washington, this site is an easy day trip if you live in or are visiting Portland, Oregon. Jumpers may book a specific reservation time and can bungee year-round, but prepare for cold and damp if you’re jumping in winter. Bungee Expeditions leads jumps off the High Steel Bridge near Shelton, a Puget Sound town that is a two-hour trip from Seattle. The bridge measures 365 feet high and is on a national forest development road. The company will not make the trip without at least 12 participants.